With a goal of transcendent awareness, John Shea presents this commentary on the Sunday Gospel readings for those who are drawn to the spiritual wisdom of the Gospels. Ideal for Christian preachers and teachers, and Christians who meditate on the Gospels, Shea's book takes a literary-spiritual approach. He analyzes the mindsets of characters and how Jesus complimented, critiqued, praised these mindsets, to inspire meditation, reflection, and spiritual development. On Earth as It Is in Heaven, Year A is the first book of a four-volume set, The Spiritual Wisdom of the Gospels for Christian Preachers and Teachers. This set is a Lectionary-based resource that references both Roman Catholic and Revised Common Lectionaries, making it useful and interesting to various Christian denominations. A Scripture index makes Sheas insightful reflections accessible for personal reflection on the Gospel texts as well as other uses outside of liturgical preparation. 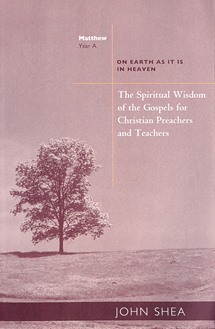 With wisdom relevant to our contemporary world, The Spiritual Wisdom of the Gospels for Christian Preachers and Teachers: On Earth as It Is in Heaven will find its way to the top of your resource list. John Shea, STD, is a theologian and storyteller who lectures nationally and internationally on storytelling in world religions, faith-based health care, contemporary spirituality, and the spirit at work movement. He has published thirteen books and lives in Chicago, Illinois.
. . . a valuable resource for anyone searching for wisdom as it is revealed in the Gospels. Jesus' compassion and unconditional love and mercy are thoughtfully and spiritually presented with a sound foundation in Scriptural knowledge and a fresh perspective in the spiritual wisdom of those Scriptures. This resource would be beneficial for teachers of Scripture and for personal or small group studies. An invaluable resource for presiders and people, parents, teachers, catechists, and all who desire the Spirit's pleasure, passion, and purpose in their lives. Shea focuses on the conversational patterns that communicate spiritual wisdom. In particular, he pays attention to the art of Jesus' teaching style, how he gears what he says to the mindsets of people, and how he marshals his rhetoric in the service of breakthroughs in consciousness. . . .bring[s] the spiritual wisdom of the gospels into dialogue with contemporary life. Prayerful meditation on the word of God is a way to spiritual wisdom. I will be looking forward to the next three books to complete this series. Although your library may be bulging with gospel commentaries, this book will help you make the word come alive. It is a must. Billed as a resource for Christian preachers and teachers, this commentary has potential as a resource for small faith communities, RCIA groups, faith based counseling, and as a tool for spiritual direction and spiritual mentoring. We can eagerly await the next three volumes. The strength of this text is its literary approach . . . a second strength of the text is the author's genius for theological reflection . . . a third strength of this commentary is the spiritual wisdom that is imparted. This commentary has potential as a resource for small faith communities, RCIA groups, faith based counseling, and as a tool for spiritual direction and spiritual mentoring. We can eagerly await the next three volumes. This book is ideal not only for preachers and teachers but for anyone who wants to access the wisdom contained in the Gospels. . . . Dipping in to the book at random has whetted my appetite, and I look forward to using the volume over the course of the coming liturgical year.